Business transaction management teams today are obliged to recognize that for every transaction considered or engaged...there will be valuable – competitive advantage intangible assets in play, i.e., intellectual, structural, and relationship capital that must be accounted for through pre and post transaction due diligence. • at risk, i.e., to infringement, misappropriation, undermining, or merely ‘walking out the door’ with exiting employees pre-post consummation of the transaction. More specifically…the targets’ owners – holders of those assets, i.e., those having fiduciary responsibilities for the assets’ development, monetization, and safeguarding, are obliged to recognize the assets’ vulnerability particularly when there is a buy-sell, merger-acquisition transaction on the table – under consideration. Similarly, it would be in the interest of either party, presumably, to do what may be necessary to avoid-mitigate…any development in which the intangible assets in play – on the table were suddenly vulnerable to downward fluctuation in value-competitive advantage. Obviously, I argue the value of all the intangible assets in play, should and must remain fully intact, otherwise I would seek, on behalf of a client, to leverage – renegotiate any asset fluctuations. Transaction management teams need not look far to find adverse examples…in which assets’ value, materiality, competitive advantages, and/or revenue generation, ill-advisedly were assumed to be intact and unencumbered, but actually-diminished, became diluted, undermined, or were found to be no longer as operational or functional as initially assessed. Anyone of which, absent a comprehensive pre and post transaction due diligence could have commenced months previously. Aside from the subjective estimates of asset value – competitive advantage loss…that would ensue, should the above occur, be it attributed to (intangible asset) external infringement or misappropriation, or merely having the relevant intellectual, structural, and relationship capital ‘walk out the door with exiting employees’, the numbers could be so large and irreversible to not justify (transaction) renegotiation. In-point of fact, the potential for these circumstances to occur…have moved well beyond the realm of annoying probabilities to nearly becoming inevitable and very costly realities if left unchecked or un-considered in transaction (pre, post) due diligence. ‘start-up’ costs can be minimal, especially when the necessary assets are ‘in hand’. bad actors can operate with relative anonymity globally. the presumed legal deterrents are lax, inconsistent, or non-existent. the extraordinary speed in which infringement – misappropriation can materialize and adversely affect a transaction. 1. a companies’ loss tolerance threshold (tipping point) insofar as economic, competitive advantage, market share, image, goodwill, consumer confidence…? 2. the probability such losses, should the occur pre-post transaction, will be irreversible – permanent and what, if any, recovery options are available, and how much will they cost your company…? 3. the degree of global universality of your company’s products and/or services and are there any potential dual-use components or applications within those assets…? 4. the cultural (business, legal, government) receptivity to (climate for) infringement – misappropriation in the host country-region where the transaction will be executed…? While these represent only a few of the considerations I urge…company transaction teams to consider, I especially urge them not to dismiss these questions solely for the expediency of consummating a transaction. It’s equally important to recognize that economic – competitive advantage hemorrhaging…can commence in advance of transaction negotiations. A reality is though, some management teams (still) assume they can consummate deals and commence revenue streams before any assets will be infringed, misappropriated, or undermined. In today’s ultra-competitive, sophisticated, and predatorially aggressive business arena, such a position could be accurately characterized as ‘permissive neglect’! 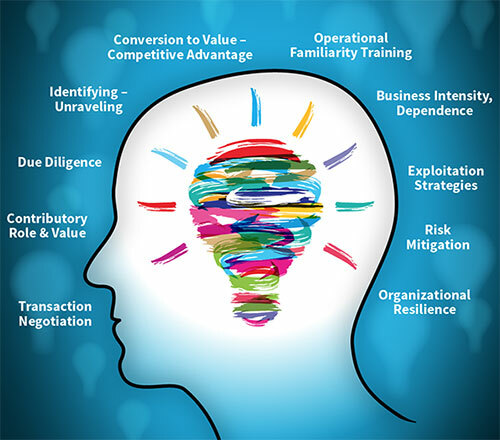 Michael D. Moberly October 11, 2018 kpstrat.com m.moberly@kpstrat.com ‘Business Intangible Asset Blog’ (since May 2006) where attention span, business realities, and solutions meet! Categories: Business Transactions, Intangible Asset Pre-Post Transaction Due Diligence Tags: Assumption that transactions can be executed with minimal due diligence., Business transaction expediency., Business transactions require pre-post due diligence., Transaction due diligence emphasis on intangible assets.